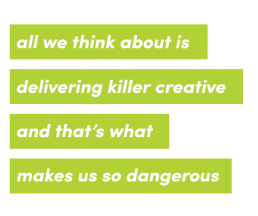 We’re Armed & Dangerous, a brand and design agency that offers a full range of creative services from print to social to broadcast, and pretty much everything in between. If we specialize in anything, it’s making your brand emotionally relevant to your customers, and helping to define how it aligns with their values and positively impacts their lives. We work with established and fledgling brands who are looking to make believers out of their customers. We also specialize in partnering with digital, strategy, and other marketing agencies that need to extend the creative capabilities they may not have in-house, delivering experienced creative teams that can quickly tackle any type of project. We’re new, but we’re not new at this. We’re agency veterans, and we’ve found that model to be a wet blanket on the flames of a good idea. We’d rather pour gas on it and watch it grow. We might not be right for everyone, and that’s okay. We want partners, not clients. We adapt. We disrupt. We stay flexible. We gain insight. We give a damn. We do whatever it is we have to do to find the best solution to your problem. We’re rather undisciplined in all respects, and operate fast and loose. We bring in the right talent as needed, which enables us to deliver more for a lot less than your previous bottom-line might be used to. let's be partners in crime. © 2019 A&D | Armed & Dangerous Creative, LLC. | All Rights Reserved.